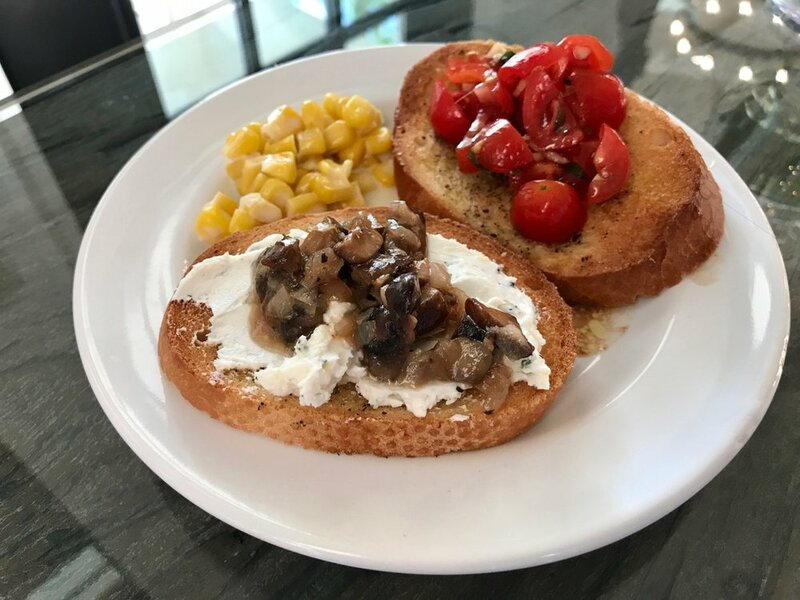 So happy to be back in the kitchen with my "Napa Love" menu: Bruschetta Bar with Traditional Tomato-Basil, Herbed Goat Cheese, Sautéed Mushrooms, & Sage Creamed Corn, Tuscan Pork Ragu, Chopped Kale Salad with Warm Pancetta Vinaigrette, and Chocolate Croissant Bread Pudding. We broke open the wine and started on the Bruschetta Bar! You guys -- guess what I did! I burned the bread. (Surprise surprise!) Kitchen mistakes happen. Don't stress! Luckily, I know myself too well and planned for extra bread. Plus, it gave my students a chance to jump in and help. Thanks ladies! 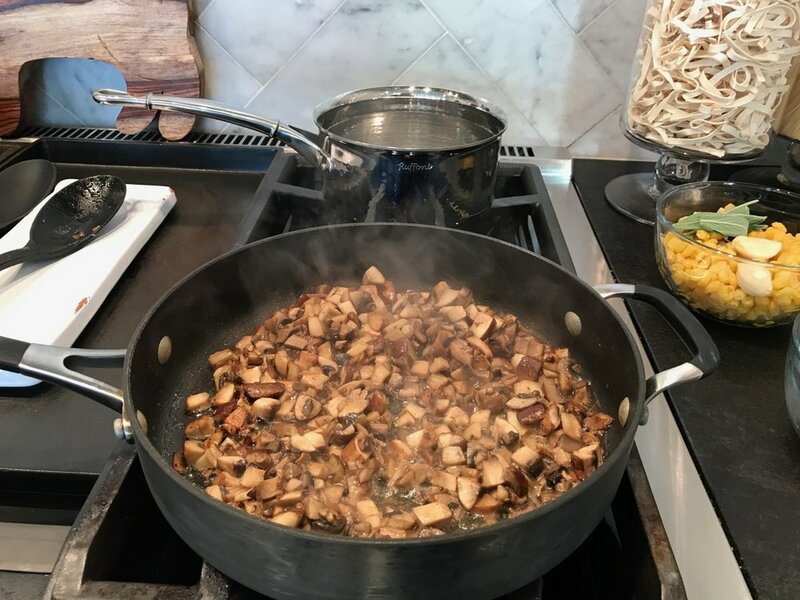 I showed the students my favorite way to sauté mushrooms (with white wine of course!). Next, we whipped up a Sage Creamed Corn which is delicious enough to be served as a side dish if you wish. 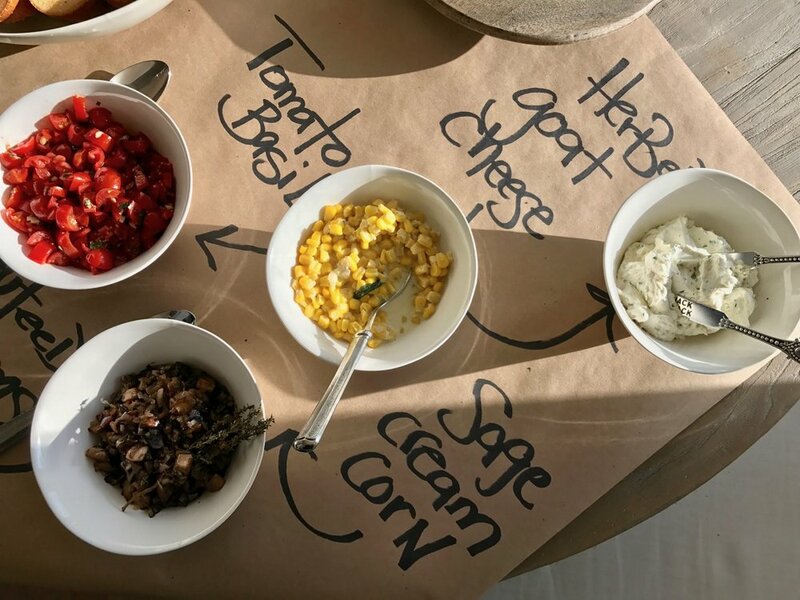 Once all the toppings were prepared -- it was time to dig in! This bar is fabulous because each of the toppings can stand alone or be paired with one another. The Tuscan Pork Ragu is one of those recipes that needs to simmer for about two hours so we got right on it while noshing on our bruschetta. Made from fresh vegetables, tomatoes, chopped pork roast, and red wine... it's a true gem. In between the entree and salad recipes, I like to start the dessert. 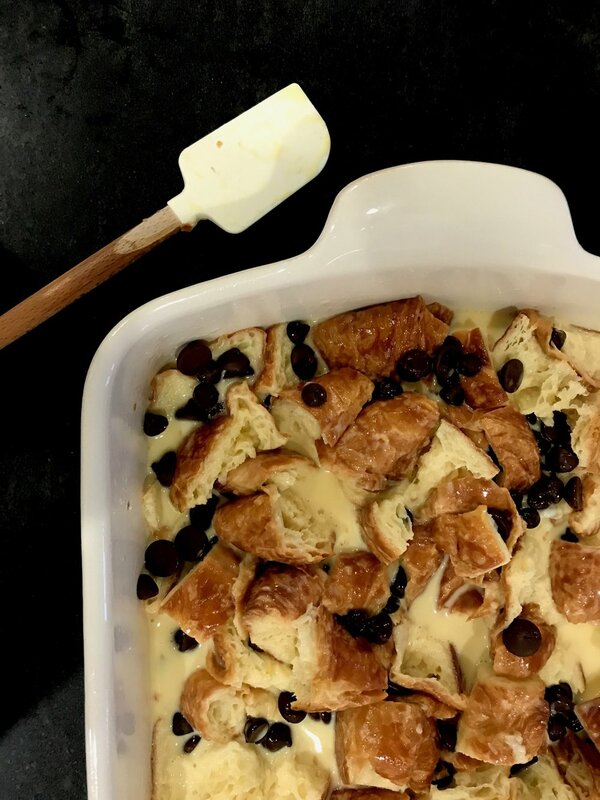 Bread pudding doesn't have to be complicated! My version isn't overly sweet. 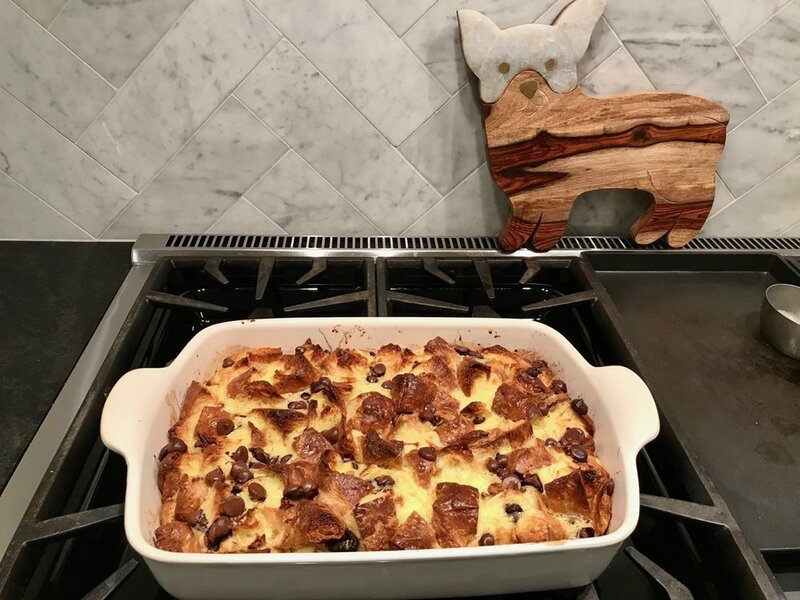 I rely on the custard and dark chocolate chips to add a subtle sweetness. 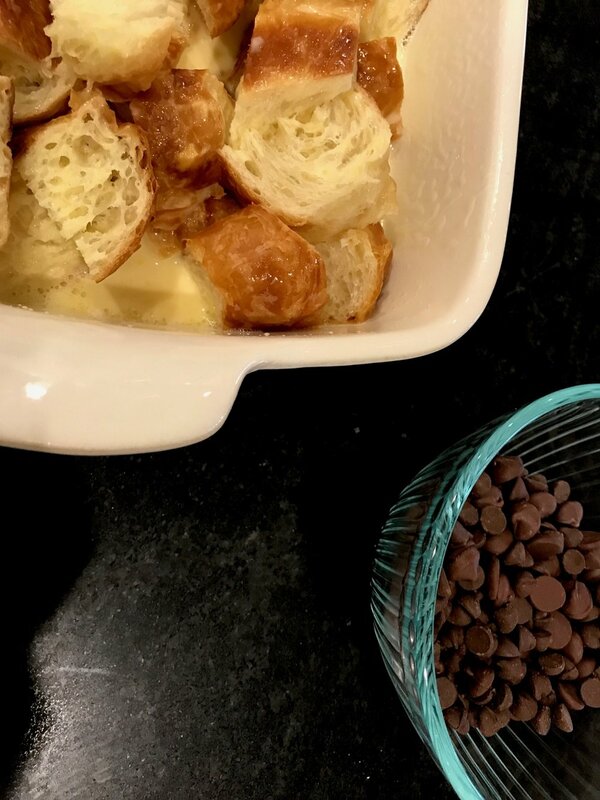 Once the croissants soak up the custard -- into the convection oven it goes! 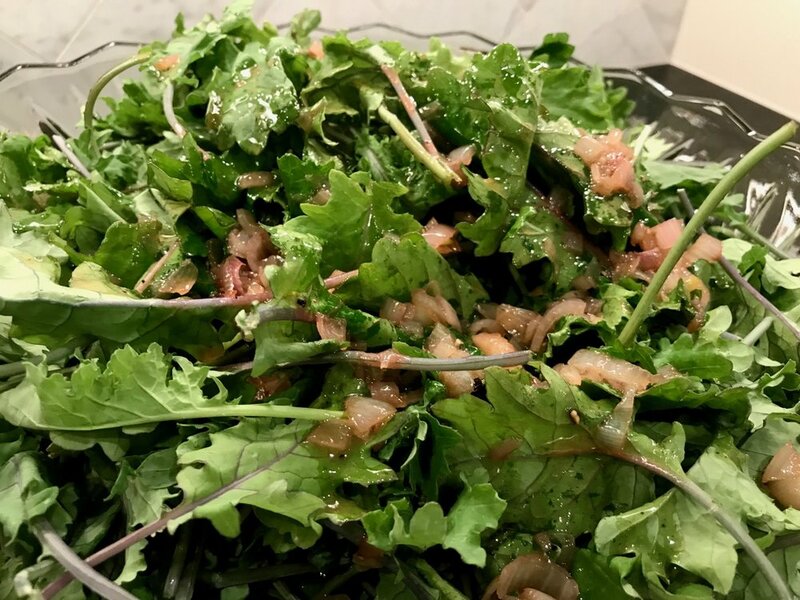 Kale is a much heartier green so I crafted the Warm Pancetta Vinaigrette with the intent to soften it. It brings out such a nice green color and makes the kale a breeze to eat. Last step? Boil the pasta! 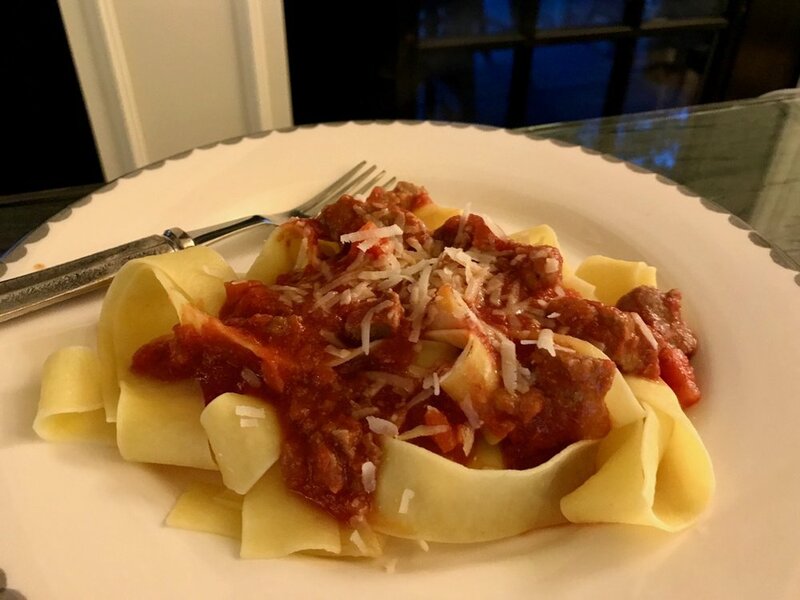 Papardelle noodles are a great pairing for the Tuscan Pork Ragu. Simple trick: reserve a bit of the salt water in the pot to keep your noodles from getting sticky or drying out. Bon appetit! Thanks for a wonderful class ladies!